German May industrial production fell 1.8% from April, on a price, seasonally and working day adjusted basis, the Federal Statistical Office (Destatis) reported today. This was much lower than most economists had predicted. May saw the steepest fall in German industrial production in two years. It was the third successive fall in production. April industrial production was also revised lower, to a fall of 0.3% from a previously published increase of 0.2%. 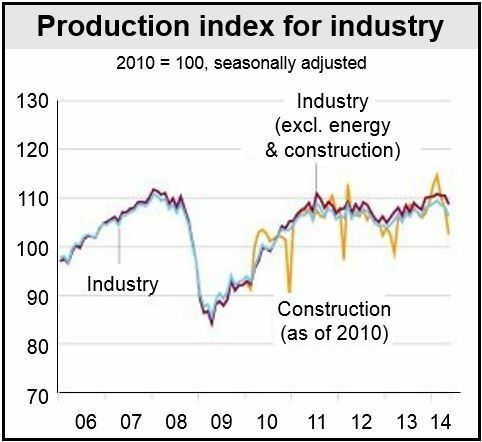 Production in industry excluding construction and energy shrank by 1.6%. Taking the Mar-Apr-May three-month period, which irons out short-term fluctuations, industrial production shrank by 1.1% compared to the Dec-Jan-Feb period. After a good first quarter, German economic performance has slowed down considerably. In May, apart from a steep fall in production, retail sales and industry orders have also been disappointing. Despite a high number of public holidays, the Q2 figures so far point to slower economic activity. The German government said strong domestic demand plus a healthy jobs market should push GDP growth to 1.8% this year. The ZEW Economic Expectations Indicator worsened in June, dropping 3.3 points to 29.8, its sixth consecutive fall. However, June’s slide was considerably less than the 10-point May decline. 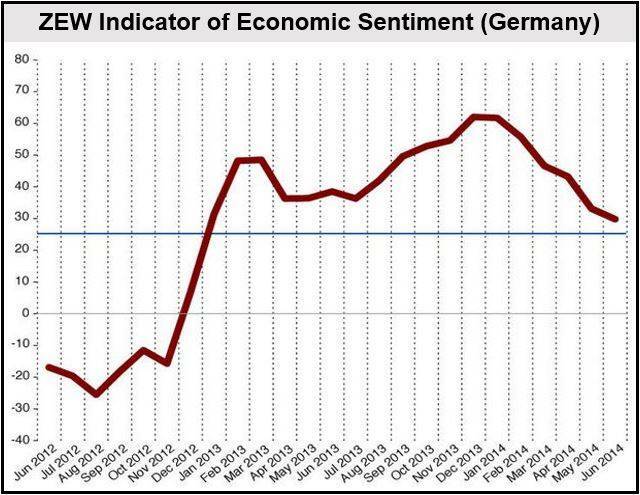 ZEW’s assessment of the current German economic situation increased in June by 5.6 points to 67.7, as has the Eurozone indicator, which rose 3.2 points to 58.4. The Eurozone’s current economic situation indicator fell 2.1 points in June to (minus) -27.7 points. Economists at the Bundesbank, Germany’s central bank, say they are still optimistic about the country’s economic outlook for the next three years. They predict GDP will grow by 1.9% in 2015, by 2% next year and by 1.8% in 2016.